I love hot deals. You’d be surprised how cheap you can get some things if you know where to look. I’ve saved thousands of dollars by finding the best deal possible on an item before making a purchase. Like I’ve said before, paying less for the same item doesn’t mean that it’s less quality or the item will provide less enjoyment. Paying less for the same item just allows you to enjoy your money on other products. These sites both provide tons of information on where and how to get the best price on your next purchase. 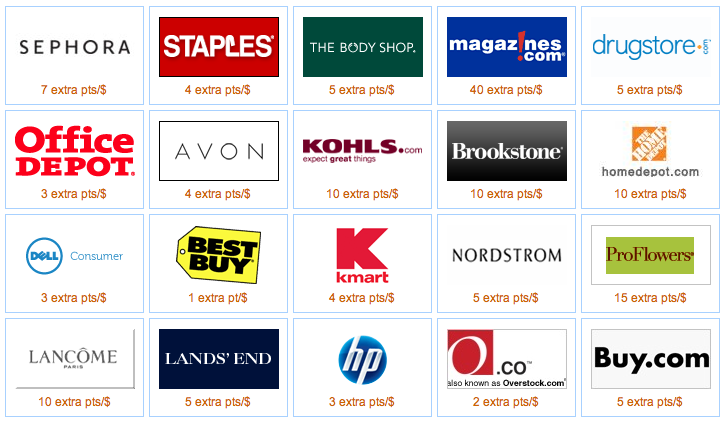 Both websites have message forums where you can interact with other hot deal seekers. Both sites also have individual forums where you can ask for help finding a deal. Many hot deal seekers who are more than happy to help someone else save money. These site users have helped me find deals numerous times in the past. In my experience with fatwallet and slickdeals, slickdeals seems to provide more up to date hot deals. I personally prefer fatwallet for its interface and find the people nicer there as well. Regardless, the people on both sites love to share a good deal when they find one. You have to act fast because the best deals go quick. Fatwallet is unique because it features a shopping section that offers cash back rebates. Fatwallet makes money when you shop through their referral links, and they provide users a small percentage of cash back on your purchases, which is paid to you via paypal or check. You can see Some examples of current deals: 6% cash back on purchases made at Puma, 4% cash back at Kohls, and 4% cash back at Sears, to name a few of the hundreds of popular stores participating. This is great because when you use your credit card to pay for your purchases, you can get double the rewards – a bonus back from fatwallet as well as points / cash back from your rewards credit card. The one downside of fatwallet cash back is that it can take 90-121 days to receive this cash back. If I’m in a hurry and looking for a specific price on an item that I would like to purchase, often times the first place I will go is www.pricegrabber.com. Pricegrabber is a site partnered with over 13,000 merchants, retailers, and sellers to provide free information on products in several categories. You simply type in the product you’re looking for, and pricegrabber will display different merchants where you can purchase the product at the cheapest price possible. Last week, my mom wanted a new laptop. I scoured the internet to find the best deal possible on the laptop that she wanted. 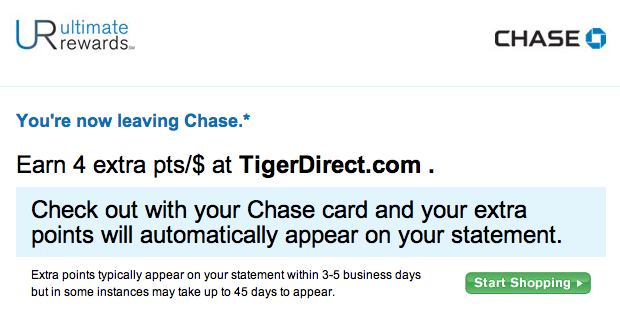 I found out that www.tigerdirect.com had the best deal. The next thing I did was login to www.ultimaterewards.com and see that Chase was offering 4 extra points per dollar on purchases made through Tiger Direct (5x points per dollar). After my $1000 purchase, I received 5000 points (instead of 1000), which directly converts to $50 straight up cash or up to $75 worth of travel purchases (which is what I will save these extra points for). Don’t forget, when purchasing electronics, you should ALWAYS use your credit card. My credit card extends the warranty on this laptop for an extra year beyond the manufacturer’s original warranty. Also if the price drops on this product, I will get a refund on my credit card as well. When shopping, always secure the best deal possible on your purchase.